Since our records may not be enitrely updated and we have a share of people who follow NEPCA via the Follow or Email features on this site, we wanted to also post this message here. 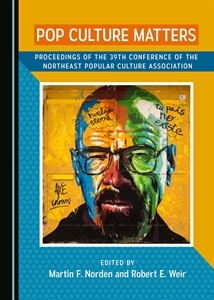 It’s been just over a month since our 2018 NEPCA conference and I wanted to thank you for another great and engaging conference, filling with amazing research, great conversations, and the coming together of new and old friends! As some of you know, I am Lance Eaton, the new NEPCA Executive Secretary after Rob Weir’s long and fantastic tenure of the last fifteen years or so. I’m excited to serve in this role and hope this email shares some of those ways in which I hope us to grow in the future. I can promise two things about it the following contents: Much of it is explain opportunities for you as members and the rest is soliciting feedback from you. We are still working out the details for where this will be but should have it soon. We’ll be announcing it on the website as soon as we do. Speaking of which, I do not like to send emails frequently as we all have plenty to read. But if you want to be caught up to date with what NEPCA is doing, please be sure to follow us. Your best bet for updates is to actually sign up for emails on our website (just on the right-hand side is the sign up). BTW, have you seen the update NEPCA website? What do you think? You can also follow us on social media: Facebook & Twitter! We have a survey we would love that you could fill out to help us better understand and learn about your relationship to the organization and how we can serve you best in the future. It’s only 9 short questions! Survey Link – Please complete this by December 15! Did you know that there’s many different ways to participate with NEPCA? We have several opportunities (and some new ones) that we believe many of you could meaningfully contribute to our ongoing work. Serve as an Area Chair (We currently have open spots in Celebrity and Fan Studies, Music, New England Studies, and War, Peace, and Culture). Also, we have some newer writing opportunities for members! If you have questions about these that aren’t answered on their respective pages, please email us to find out more! Is your new book about to come out? Have you published an article? Have you obtained a degree? Did you recently receive an award? We’d love to hear from you about your recent achievements to share out to our community on our social media platforms. If you attended the 2018 Conference at Worcester State University and have any photos that you would like to share, we’d love to host them on our social media. Please be sure to send them with us. Be sure to, if possible, include who is in the photos. Have you ever thought about having your institution host a NEPCA conference? We are looking for future sites to have our conference. We have found that having them at colleges of organizational members gives our conference a bit more charm. If you think you would like to look into hosting a future conference, please let us know! Thank you for your attention and I look forward to your insights!